The Ruby gas field is located between Kalimantan and the island of Sulawesi in Indonesia. Image courtesy of Inpex Corporation. The field lies at a depth of 60m (198ft) in the Makassar Strait. Image courtesy of Roregan. The natural gas production at Ruby field began in October 2013. Image courtesy of Inpex Corporation. The field lies at a depth of 60m (198ft) within the Sebuku Production Sharing Contract (PSC) in the Makassar Strait. The first gas production from the field occurred in June 2013, while full scale gas production commenced in October 2013, with the establishment of an export pipeline at the field. The gas is purchased by PT Pupuk Kalimantan Timur. PEARLOIL (Sebuku), a subsidiary of Mubadala Petroleum, operates the Ruby gas field, with 70% stake in the Sebuku PSC. The other two license partners include Total E&P Sebuku and Inpex South Makassar, each holding a 15% stake. The Ruby field produces gas, from four production wells, at the rate of about 100 million standard cubic feet per day (17,000boed). The field is expected to produce about 250 billion cubic feet of gas during its expected life of ten years. The gas is sold within Indonesia for domestic use. Indonesia has the 14th biggest gas reserves in the world, with about 106 trillion ft3 of proven reserves. About nine percent of the global liquefied natural gas was exported from Indonesia in 2009. "PEARLOIL (Sebuku), a subsidiary of Mubadala Petroleum, operates the Ruby gas field, with 70% stake in the Sebuku PSC." The Ruby gas field lies in the 2,345km² Sebuku PSC block. Mubadala and Total initially conducted exploration at the field, including three-dimensional seismic surveys. The field development plan was approved by the Government of Indonesia in July 2008. 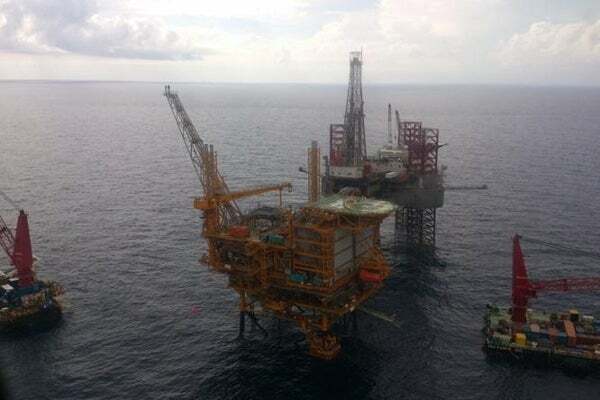 BPMIGAS, the Indonesian Upstream Oil and Gas Executive Agency, approved the construction and installation of the Ruby field infrastructure in June 2011. The field exploration, appraisal, development and production were carried out by Mubadala, Total and Inpex with an investment of about $500m. Mubadala invested about Dh1.2bn ($350m) on the field development. The offshore production and processing facilities at the Ruby field include a tripod wellhead platform (WHP) and four-leg processing and quarters platform (PQP), which were constructed in Pendingan and Handil respectively. "The field is expected to produce about 250 billion cubic feet of gas during its expected life of ten years." The WHP and PQP steel jacket loadouts were constructed in Batam. A bridge connecting the production platform, along with a 14in wide and 312km-long subsea pipeline connecting the Ruby platform to a dedicated terminal, were also built. The natural gas produced at the field is delivered through a subsea pipeline to an onshore processing facility at Mahakam Block. The gas is then processed and supplied to a fertiliser plant, situated in East Kalimantan, through an onshore pipeline. Saipem was selected by PearlOil (Sebuku) to provide transportation and installation of offshore structures for the field in September 2011. The contractual scope included providing transportation and installation of the PQP, WHP and an interconnecting bridge. The platform facilities were constructed between September 2011 and March 2013. The platforms installation was completed in June 2013. ShawCor’s pipe coating division Bredero Shaw was awarded a contract worth $30m to provide pipeline coatings and related products and services for the field in March 2013. The scope of the contract included coating the 14in diameter export and tie-in pipelines with three layers of asphalt enamel anti-corrosion coatings and concrete weight coating. The works also included anode procurement and custom coating installation. Asian Offshore Services (AOS) is an internationally recognised designer and manufacturer of modular buildings and cabins for onshore and offshore oil and gas, petrochemical and marine applications.